As great as Laurel Hill Farm is for general events, it truly shines when we host our favorite events, weddings. From intimate affairs to formal events, a wedding at Laurel Hill Farm is always special. Set up your own event, or work with one of our local event planners to make your day magical. If you are a do-it-yourselfer or a professional planner, we welcome you both to use our facility. Our lush lawns offer space for almost unlimited seating for your ceremony, and our facilities will make sure your guests are both comfortable and in a setting that is perfect for your most important day. Evening guests are welcomed to stroll through our immaculate stable of horses in their stalls en route to the ballroom. Come tour our facility and see for yourself! Choctaw Lodge Retreat is located on the historic Choctawhatchee River, only 25 minutes from Panama City Beach and 35 minutes from Grayton Beach/Destin area. We are a beautiful and unique venue nestled on the river bank surrounded by hundred-year old trees and exquisite gardens, offering many different choices for your ceremony. There are two guest houses on property, either ideal for a very special honeymoon. We offer a full service wedding planner or you may rent the property only and bring in your own planner. Choctaw is the indian word for Coming Together! And that is what happens when you have your wedding at Choctaw Lodge Retreat! 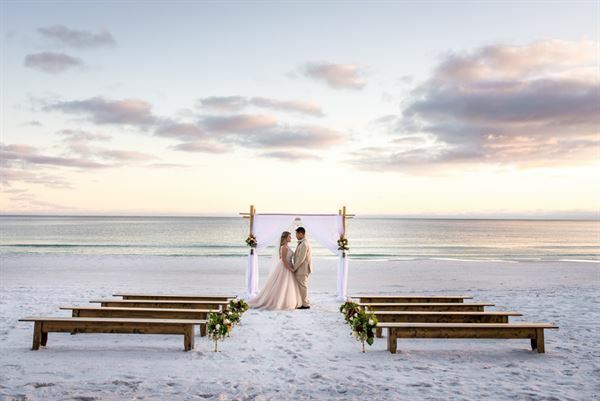 The Brooks-Beal Center, centrally located in Fort Walton Beach, is a a multi-use facility serving as a superb event venue with unlimited possibilities! Host your wedding, reunion, family gathering, conference, or any other event you can envision.